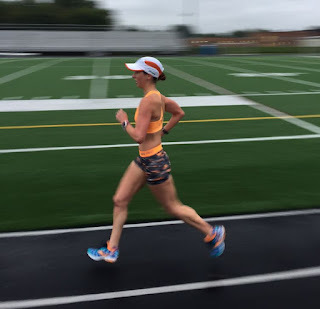 coach is excellent at having me peak at just the right time by not starting the long runs too early in the cycle and giving me a relatively short taper. My energy level has been great during my runs and throughout the day. I've been getting plenty of sleep and good nutrition. My legs have felt tired for most of this week and I've been doing a lot of foam rolling and calf massaging. I went to the sports chiropractor about my Achilles to be proactive about the issue and to ensure that I was doing the proper calf exercises. It turns out that I should not be stretching my calf and that I was doing the wrong exercise! He showed me what I needed to do and also performed ART (Active Release Technique) to help loosen things up. I typically only feel the Achilles during the first five minutes of the run, and after I'm done with the run and it stiffens up. I almost felt a bit ridiculous seeing the sports chiropractor because when I walked into his office I was 100% pain free. So right now it's manageable and I don't want it to progress into anything worse. We've had an abnormally cool week and I'm not complaining. Morning temperatures have been in the upper 50's and lower 60's. Rain has been the major annoyance, and it was really only a factor during the Saturday long run, when the remains of Harvey came through. This was a prescribed 70-minute easy run. For some reason it was slower than my typical easy run, but I didn't judge it or question it. Some days are just slower than others and I usually don't try to force any particular pace on easy days. It's just whatever feels easy. I was surprised to see this workout so early in the cycle. Last time I was prescribed 7 x 1600m was two weeks before the marathon. 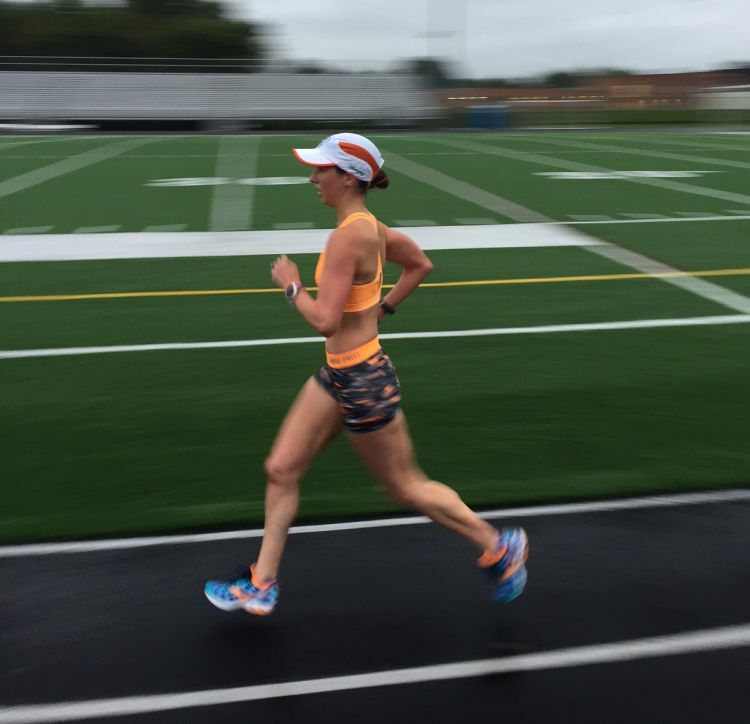 It was raining during this workout, but at 62 degrees the rain actually felt really good and it wasn't too heavy. My splits were 6:48, 6:43, 6:43, 6:44, 6:45, 6:41, 0:42, 0:42, 0:43. I felt really strong during this workout. My legs felt powered and I had a good amount of energy. I was expecting to break 6:40 on at least one of them, but it never happened. I probably could have done it if I exerted more effort, but with 6 of them, I didn't want to push too hard too soon. I was disappointed that the last one wasn't under 6:40 but my coach told me not to worry about it because my legs are likely still adjusting to the higher mileage. Someone on Instagram commented that he thinks my half marathon pace is probably 6:45 based on this workout, but I'm not sure if I agree! I ran 12 miles total, including the warm up and cool down. My legs felt peppy on Wednesday, which was super encouraging after all the mile repeats from the day before. running more of my easy runs at that pace. My coach says he's seen athletes make significant gains by running at the faster end of their easy range. According to the McMillan Calculator, my easy runs should be in the 7:37-8:37 range. This has always seemed fast to me, as my range tends to be more like 8:20-8:50. As I said above, I simply run what feels "easy". So I did this workout. The first two miles were 8:58 and 8:08 because it always takes me awhile to "get into it" and then I spent the rest of the run right around 8:00. So how did it feel? Miles 1-3 felt hard. It's difficult for me to run quickly out of the gate. Miles 4-8 actually did feel easy. I ran up a hill at mile 9 and maintained the pace, which tired my legs. My legs were tired for the remainder of the run, but I still felt like I was working within my aerobic range at an easy effort level. I believe that easy days are meant to help you recover from hard days and you shouldn't push it. But if I'm feeling good and I can run a little faster while still having it feel "easy" then I will do it. 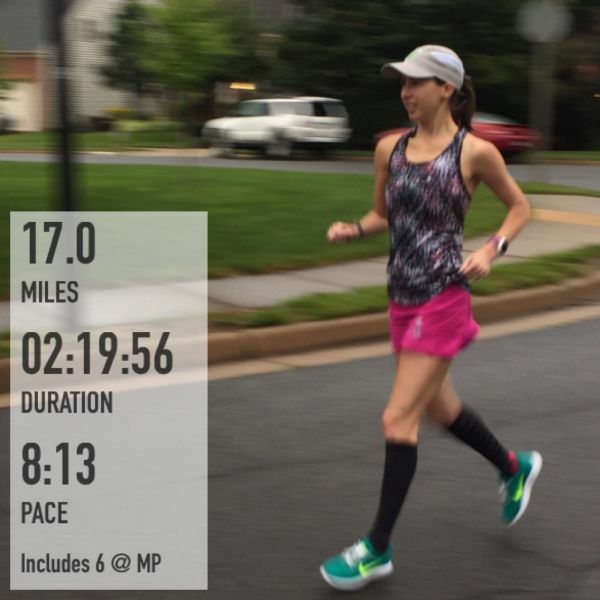 My mileage is really high right now so my legs probably won't like it all that much, but I can see running an 8:00 pace for my easy runs more often if I am not logging 60+ miles per week. Speaking of tired legs, they were tired on Friday. Knowing that I had a long run the following day with marathon pace miles, I ran this one as a recovery run. year, and I was actually cold. The first 10 miles averaged 8:48 on a hillier-than-normal route. Then it was time for six miles at marathon pace, so I ran ahead of Greg while he maintained an easy effort for the rest of his run. 17 miles is the threshold at which I carry UCAN with me in addition to having it beforehand. So I practiced making a UCAN gel and stored it in my skirt pocket, taking it at mile 8. The transition from easy to marathon pace was tough. I increased the effort and it felt hard, but I was still about 25 seconds slower than my goal pace. It was basically a shock to the system after spending 90 minutes running at an easy pace, to shift gears to race pace. After about 10 minutes, though, I got into the groove of marathon pace and it didn't feel as hard. The rest of the marathon pace miles felt good. I had to work hard, but I wasn't hurting or straining. I finished off with one final easy mile in 8:20. Marathon pace miles were 7:38, 7:29, 7:23, 7:18, 7:24, 7:18. They averaged 7:25 (which was the target) and the entire 17 miles averaged 8:14. A true recovery run after a long week! I have another hard week coming up and then I'll get a bit of a taper before my half marathon on September 17th. Great week for you! I think I need your sports chiro to do some work on my calves. They're tight! A lot of places were cold this weekend weather wise. Not here, lol. Looks like you had a good week! That's a ton of mileage and some super strong workouts (the 1600s... OMG). I feel like if you can run 6 1600s at that with the recoveries in the middle of the week, on tired legs, then maybe your half marathon pace is close to that or not too much slower? You gotta give yourself some credit here that you've gotten way faster and haven't really "raced" a half in awhile, between Boston, mono, MB, the 5Ks, and the cruise. Never know what you might be able to do! You could be right about HMP. We will just have to see in two weeks. Although it could be a warm day, and the track workout was nice and chilly with that rain. Thanks for the encouragement. Nice job! That rain was something on Saturday. We were also in the middle of a 17 miler with MP (what a coincidence) when the skies opened up. Crazy. I will be interested to see how the faster easy runs work for you. You know my personal practices on easy runs. But I also think that you and I are very different runners, in terms of what works for us, and so this might actually work well for you. Yeah, my shoes immediately turned into heavy bricks on my feet! My coach clarified for me that he would indicate which days should be faster easy days, which is a relief. So far, he hasn't prescribed any more of them. We've both seen major gains over the past two years doing completely different things, and it's a testament that different things work for different people. So much good mileage! I love how focused your training is (the benefits of a coach I guess). Not sure I could be so rigid (well not rigid but succinct perhaps). I like to chop and change all the time. Well done for being proactive on the Achilles! Pretty impressive week or run training, definitely that 17-mi LR with last 6 at MP. Regarding the slower start speed for the Thursday run, fairly normal to feel "harder" at start as takes time for the HR and internal physiology to catch-up and get in sync. But 8:04 as an "easy" pace seems a bit of a stretch from my perspective. And if you want to try workout that helps makes your MP feel both physiologically and mentally easier, then try some threshold intervals...usually 0.5-mi to start. WU, then you do a series of 0.5-mi intervals at 10-30 sec faster than MP, then followed by recovery interval of equal distance at MP and repeat the process, 4-6 repeats first time, then you can increase the number of repeats, or increase the distance, but the recovery at MP is always equal to the distance of the work interval. Purpose of the workout is it nurtures adaptations that make your muscle cells better at processing lactate accumulation while running at MP. After several weeks of incorporating variations of this routine, you should observe that it feels easier when running at MP. Ask your coach about it. Your training is going so well! That mile repeat + 200s workout was killer! 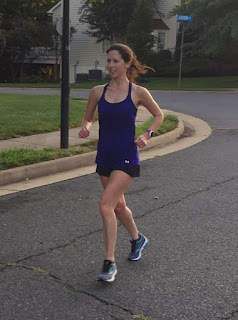 I agree that easy days should be completely easy, but I also think that as your fitness builds, your easy pace will naturally get a tad quicker. I tend to run my easy runs slower than a "pace calculator" says that I *should* too though. I also 100% agree with you that sleep plays a huge role in our recovery and I have definitely been to the sports chiro just for preventative measures. I'm actually going to go once a week during this next marathon training cycle. Anyway, keep up the good (and smart) hard work! Dang! Also meant to ask ... how do you make a UCAN gel? I use UCAN before my LRs and marathons, but I've not made a gel with it. Seems like a great idea though, because otherwise it's hard to coordinate carrying or getting another bottle in while out on the course.